Living Legend Sachin Tendulkar - A site from a die hard Sachin Tendulkar Fan: Sachin Tendulkar - I will miss Sourav Ganguly. Sachin Tendulkar - I will miss Sourav Ganguly. Sachin Tendulkar says the entire country will miss the elegant left-hand batsman - Sourav Ganguly, who has often been described as the 'God of off-side'. Sourav Ganguly -who is retired from international cricket after nearly 16 years.He would be remembered as one of India's most sucessful captain and charismatic cricketers.He played his last game as international player at nagpur. Everyone will miss Sourav. He is not only my teammate but is a very special player and has contributed a lot to the team and country. He has had a fantastic career and when a player like him retires not only the team but the entire country will miss him, Tendulkar said. Also Tendulkar quoted , I used to talk with Ganguly in Bengali. How correct was my language I don't know. But we had great time both on the field and off the field. 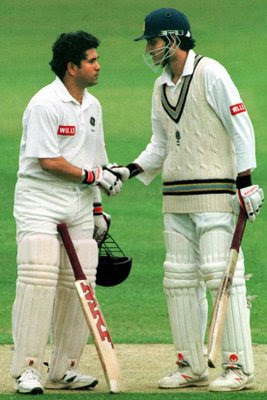 While batting we both understood each other better and talking to each other.One can't become Ganguly overnight,it takes years of perseverance to reach that level.Surely I will miss him ! Ganguly's last Test innings, just like Sir Don Bradman, ended in a duck on Sunday. He was caught and bowled by Jason Krejza in the second innings of the Nagpur Test against Australia off the first ball that he faced. A bit disappointing for Ganguly and his fans, but his fans will look back on his international career with great pride. He started with a century on debut and made a sublime 85 in the first innings of the Nagpur Test against Australia; although he had to end with a golden duck.